- If you buy something for one child, the other two must have one just like it...so you have end up having 3 of the same thing (3 squirt guns, 3 art pads, 3 bikes, 3 scooters, 3 sand buckets, etc.). Sharing is not part of the rule of thirds. - If you reward one child for doing something wonderful, you must quickly find something wonderful that the other two children did so they may be rewarded as well. - If two children go to camp, you must have a "mommy and me" camp at home with the third child. - The third child, no matter how young, must be allowed to attempt everything that the older two children do. Whether you as a parent like it or not. The third child will ignore you and do it anyway. - When three siblings get along, all is good in the world. Your rules are so true. Great photos! I love your rules!! I will have to keep them all in mind since I have 3! And your photos are absolutely beautiful! I love your view on this...and that 2nd picture is beyond priceless. 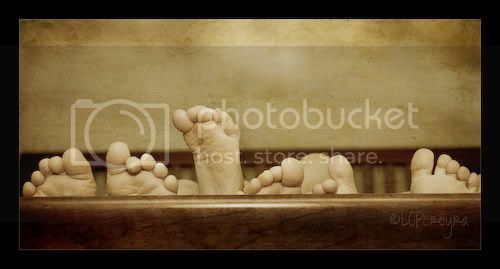 Serioously the cutest foot photo I have ever seen! ohhh I love the tootsies and the texture over it fab!!! The rules are SO true!! And I LOVE that last shot--I can almost hear them laughing. So cool!! Wow that second one is fantastic. Great composition, great dof, great perspective. I love everything about it. Love your rules! This is also true with two kids too, I am finding...especially the buying thing! These are really brilliant photos. I love the first one. I would get it on canvas. That second photo is awesome! Love their little piggies. The Rules is to cute and very true. The photo is so cool. That 2nd photo has to be the cutest foot photo ever!! I absolutely love it! Those rules are great...We have the rule of 4ths at my house. :) Your shots are wonderful. Love those little piggies all in a row. love the commentary. so true. the second photo is my favorite. i can see that big in a bedroom. I love your first foot photo! Your journaling is so cute! My first thought was to e-mail it to my daughter, the youngest of 3. . . esp about the part about the youngest always gets her way. But then my 2nd thought was, well. . . I better e-mail it to all 3! This would make great journaling for a scrapbook page. I love feet shots, and those peeking piggies are too cute! !